I've been watching some of the eBay auctions this week for the Glenbridge. 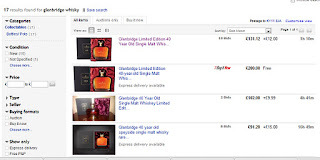 For an edition of 3000 bottles an alarming rate have been turning up for auction. I guess that's just a reflection of society these days and everyone in the hunt for a quick, and ultimately easy profit. 'a beautiful presentation box', well lets put that myth into touch. The Glenbridge bottle is where most of the money has gone but the actual box is little more than cheaply coloured cardboard. It is very flimsy and the cheap canvas within means that this is cheapest packaging of any 40 year old malt I've seen. Just go into any whisky shop to see how wonderful similarly aged editions are presented. If you do bid then don't expect a wow factor from the packaging. 'will only rise in value', of this I'm not sure. Reviews have been good and I'd hope a few have been opened already. Unless the distillery behind the malt comes to light (which will probably never happen), then this false Glenbridge bottling will be an oddity. I have been meaning to get around to the Tomatin malts but the festive season is in full flight and most pubs I've been over the last couple weeks, stock the Highland Park 18yr old. So a break is needed until next weekend when I may check the three main releases.